Grand Bard of Cornwall meets Brian Molyneux. John addressing 25 Ozzie 'bards'. John Bolitho, the Grand Bard of Cornwall, has just returned from Australia, where he was on an official visit to the 'Gorsedd' in Victoria. During the 1850's, many Cornish tin miners went off to 'Oz' to seek their fortunes in the gold fields. 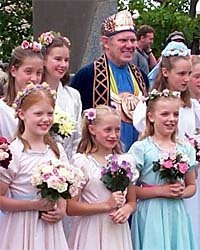 Cornish communities sprung up throughout the Country and over the years, with the help of modern emigrants, ties with old Cornish families have been renewed and Cornish traditions revived, among which is the famous 'Gorsedd' in which the 'Bards' meet and perform their historic ceremonies. The Goresdds' were formed in ancient times to bring the Celtic races together to create temporary 'peaces' (ceasefires) between the tribes. These meetings were presided over by the 'bards'. Exchanges of music & song took place and in modern times these gatherings are used to preserve and promote the Cornish culture across the World. If it is proven that an individual has been active in working for the good of Cornwall, he or she can be made a 'bard'. The highest ranking of these is known as the 'Grand Bard' and is elected by the members for a two year term. John has also been over to Canada to perform his duties there and is full of tales of generosity and warm hospitality. During his Australian tour, John visited the town of 'Bendigo' in Victoria, to attend the 'St. Pirren's Day gorsedd' there. He was approached by someone selling raffle tickets in order to raise money to purchase the first Cornish gig for the 'Victoria Cornish Gig Club'. After talking to this person for some time, it was discovered that he came from Scilly and introduced himself as Brian Molyneux. John mentioned my name and Brian confirmed that he had gone to school with me. On returning to the U.K. John called me to let me know of their meeting.